On a lovely weekend morning, this is the place you dreamed of, where you can hold onto that feeling of complete relaxation for just a few moments longer. 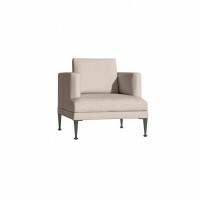 Cantate is a compact club chair that surrounds and supports your body. Beautifully finished on the back with the “Artisan” decorative stitch. The smart swivel foot automatically returns to the start position when you leave the chair. 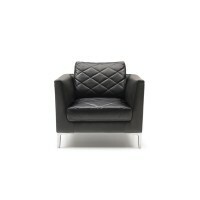 And whatever you do, don’t forget to experience the softness of the upholstery materials. Leather, fabric, or both, in a composition that you create yourself. 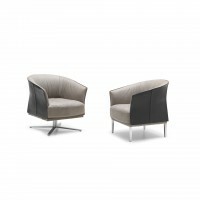 Cantate is available as an armchair and as a swivel chair with a matching footstool. On the inside and outside you can choose your favorite colors and materials from the Leolux collection. 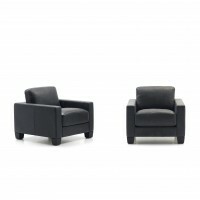 For the footstool, you can choose the upholstery on the sides and on the top. The foot of the Cantata is done in Epoxy 2200 Nuit or any other Leolux epoxy colors.